The details have been missing from the house since perhaps 1939 (the oldest known image), and certainly since the 1950s. It is unclear if they were included in the original construction. In the drawings, the extended flower box crown is important to the flow of the facade, anchoring the main windows of the living area wall while stretching the edges of the built-in garden. The house looks boxy without it. We studied the drawings to find the geometries and proportions and matched the materials of the existing flower box trim (cedar) to construct new (or replacement) cantilevers. The drawings show simple open extensions of the flower box crown with what appeared to be lateral braces. Were these braces meant for hanging baskets? With the project complete and some time to study its effects, we think that Wright’s main objective was to cast traveling angular shadows, lifting the house out and up, mirroring the louvres and art glass motif, and emphasizing, again, light, nature and the horizontal. Our experience, so far, belies the popular myth that Wright homes are leaky and cold. This little house is (knock on wood) dry and without a draft. Credit, we think, goes to the use of Byrkit Lath to sheathe both the interior and exterior walls and ceilings. Patented and marketed starting in 1890, Byrkit was pitched as a stronger, longer lasting, easier to install substrate on which to apply plaster. It’s an ingenious idea: tongue and grooved boards are milled with trapezoidal slots into which wet plaster is pressed, locking the system together, setting and sealing it as it dries. The result is a waterproof wall with incredible strength that is relatively lightweight. Void free plaster locks mated Byrkit Lath to form a super-strong wall, or in this case, ceiling. A modern metaphor is the use of closed-cell foam core materials covered in carbon-fibers impregnated with epoxy in boats, cars and rockets. The hollowness creates lightness. Interlocking fibers create strength. The uniform thin-walled surfaces create stiffness and structural integrity. By specifying Byrkit Lath in this and other American System-Built Houses, Frank Lloyd Wright may have secured this home’s legacy. In addition to creating a dry, strong and warm space that stands straight and true to this day, he may also have dissuaded major renovation. To drill a hole for a code-required exhaust vent in our new WC required a $26 masonry bit and a $26 diamond saw. Honey, I tore off the front of the house. Elizabeth Murphy must have thought cars were not necessary. The house she had built had no garage or carport. Indeed, in 1917, trolleys ran north, south and west from Shorewood. Frank Lloyd Wright may have assumed that the middle class – for whom American System Built Houses were designed – would always prefer public transportation. Here is the house from across the street in 1952. But in the 1970s, the then owners needed to park a car. They excavated part of the front yard and under the sleeping porch to create a driveway and garage. Thankfully, they did it without disturbing anything in the house above. In an attempt to tie the garage to the house, an eyebrow roof was added to the facade held up by two large stuccoed columns. Over the years, the columns shifted and the brow sagged, like a lazy eye. Indeed, cracks, angles, and layers of caulk may have caused inspectors to assume that the house’s foundation was compromised, when in fact, the facade was the only thing moving. It’s as if the house was rejecting a transplant. In preparation for the Wright and Like 2017 Tour, we hoped to clean it up. I would, at a minimum, grind out and patch the ugliest cracks. As layers came off and the extent of the effort to mask the mess became clear, I decided, instead, to tear it all off. As sledge hammer hit cinder block, you could hear the home breathe a sigh of relief. Angela returned from errands to a bit of a surprise. So for the rest of the weekend, we poured new concrete, parged walls, and cut and painted matching trim. Today, the Elizabeth Murphy House stands tall and straight, and ready for tour-goers. At this time of these images, there were still a few details to complete (we were awaiting a sink faucet which was on backorder), but the bath is complete and as close to Wright’s vision as we could make it. The 68″ x 72″ space was the weak spot in the house when we bought it, and we had plans to quickly make it right. The demolition phase confirmed what we suspected: years of steam and overflows had done damage, and the damage was covered up. 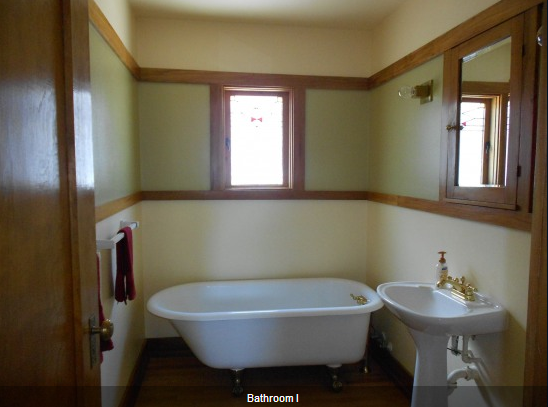 We learned that the room was originally painted plaster and trim in yellows and oranges, unlike a bath in one of the Burnham model F duplexes, – which features varnished trim. However, we’re not convinced that paint was in Wright’s plans. Since we didn’t see evidence of a clawfoot, we wonder if the builder veered from the drawings and went right to a built-in tub, and thought that paint would survive moisture. We do know that sometime in the 50’s a tub was replaced, some plaster was removed to tile for a shower, and the original maple floor which had stained and warped was covered in linoleum. Subsequent layers of tile, flooring and paint covered subsequent damage. The space seemed to close in on you and the squishy floor was an inch too high. We demoed to the studs where necessary and to the Byrkit Lath where we could, and then started fresh. We stabilized the floor starting at the joists and built a new sub-floor. We replaced all the old plumbing. We ran circuits, outlets and added a fan, new fixtures, and in-floor radiant heat to replace a 1950’s radiator. With cues from B1 and other parts of our house, we elected to return to plaster all around, a clawfoot tub, and hand-rubbed shellac finishes on the all birch trim. We recovered and reclaimed birch woodwork and the door by refinishing, and then milled and finished over 1500 new linear feet of rail and decorative trim to replace what was missing. The new floor is tile, but in a wood finish pattern. This allows for the radiant heat and won’t warp or stain the first time someone splashes in the tub. We were lucky to have found Peter Halper of Passerine Home Remodeling to help. Peter’s talents are both broad and deep: he can plumb, wire, tile and plaster. More importantly, he was willing to work with us as we uncovered clues, made mistakes, shifted our thinking, and added our own time and effort to remain within budget and on time. His true specialty is in listening, working very hard, and kindly collaborating. And finally, a note on the door. The original plans show that it was hung to open in and into the knees of a toilet sitter, making for a much smaller, already small space. We had a hard time believing that Wright meant to do this, but, alas, other homes, including the Usonian Gordon Home in Oregon, share the painful inconvenience. We decided to break with the architect on this, while preserving the views he wanted in the rest of the house. Now the door still turns in, but into a wall, not into someone’s knees.